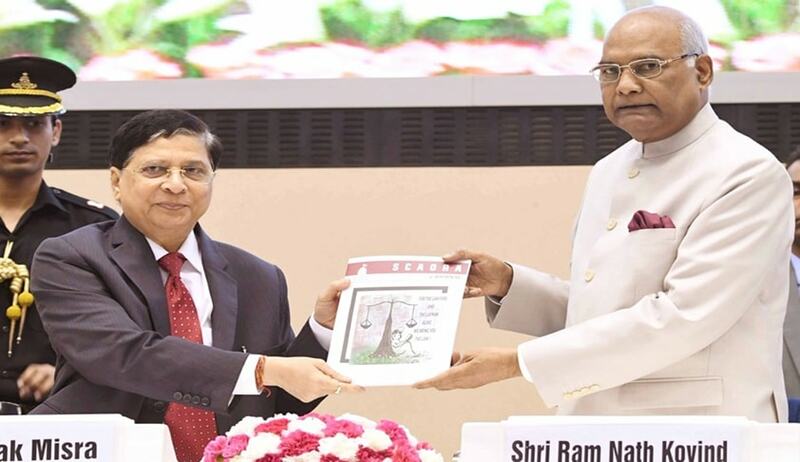 While speaking in the national conference on “Technology, Training andInfrastructure: Key to Speedy Justice” organized by the Supreme Court Advocates-on-Record Association (SCAORA) at New Delhi on Saturday Chief Justice of India Dipak Misra said Judicial infrastructure is the backbone of the justice delivery system. “The infrastructural gaps shall not be allowed to multiply for long. We must plug these gaps at the earliest opportunity before they leave a deep scar on the administration of justice and it becomes too late to act wisely. Fiscal constraint is no excuse. The need is to strengthen the judiciary as a consequence of which the justice delivery system becomes fast, qualitatively responsive and serve the cause of justice”. CJI said technology has not only accelerated growth rate in various service industries, but also generated increased social awareness and made citizens more informed than earlier to claim their rightful entitlements and has resulted in the creation of an informed citizenry, who are more vigilant and cautious of their rights against any form of exploitation by the organs of the states. “With such transformation of the citizenry, it has become imperative for the legal fraternity to respond more pro-actively in the discharge of their functions,” he said. “ Secondly, technology can enhance the quality of our work by acting as an aid in expediting the routine cases, especially in case of criminal cases where testimony and evidence can be recorded by video tapes. To this extent, Indian courts have already been making use of technology for the recording of evidence in a number of cases. ‘E-Courts’ project has also been a step in this direction. Thirdly, technological resources like a legal database can aid in strengthening the judicial research,” he said. Attorney-General of India KK Venugopal, who was the guest of honour, recounted his beginning days in the legal profession when there was no laptop, no moot courts, no seminars, no Internet and ‘Wi-Fi’ system excepting having bookies. In his 67 years of practice as a lawyer, he could see the drastic change in the administration of justice with the advancement of technology. “Today we find law students with laptops because the entire campus is Wi-Fi. They have a mass database. They are able to access judgments delivered any part of the world. This is something which has totally changed…Today the young lawyers can stand and argue the case with great confidence. Women lawyers are equally competent…There is a total change in the legal practice,” he said. He added that this a noble profession and appealed to all lawyers not to go on strike.